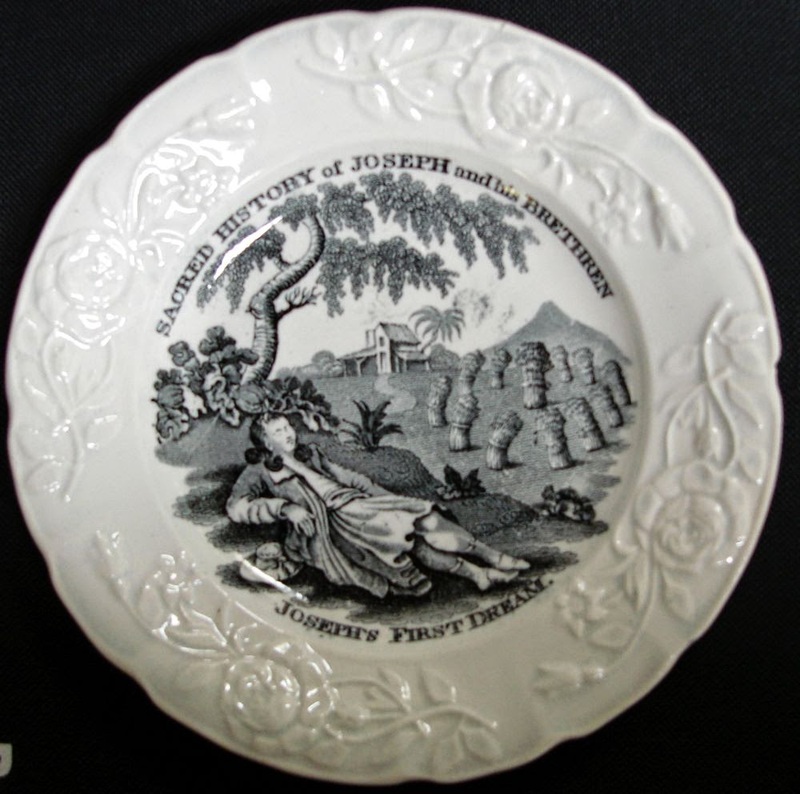 Joseph is an important person in the Old Testament as he connects the story of Abraham, Isaac and Jacob in Canaan to the subsequent story of Moses and the liberation of the Israelites from slavery in Egypt. (See what I have written about Moses here). 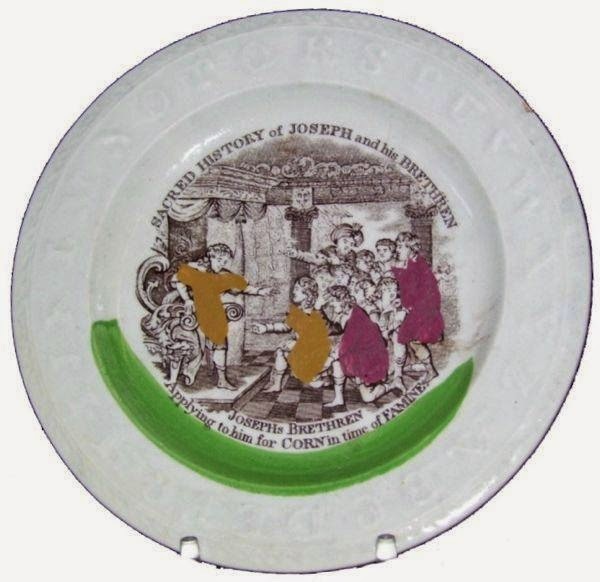 The story of Joseph is the Biblical story that appears most often on 19th century children's pottery. 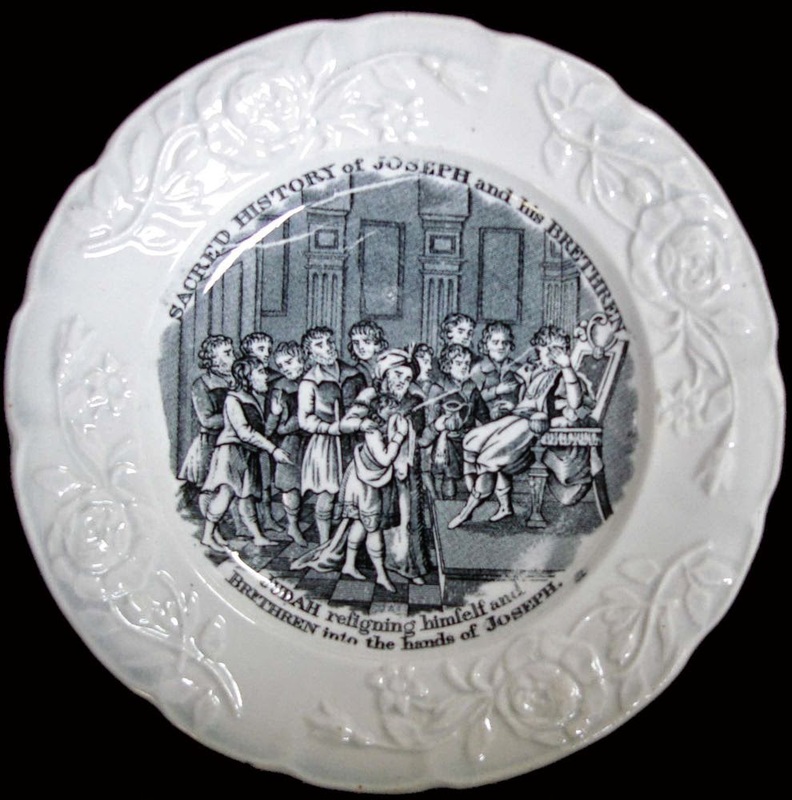 There are two major Joseph series: Sacred History of Joseph and his Brethren and History of Joseph as well as individual patterns on cups and plates. I have always loved the story of Joseph: his coat of many colors, his interpretation of dreams, his brothers' jealousy (they wanted to kill him! they sell him! ), his success in Egypt, his forgiveness of his brothers. The story was meaningful to me when I was a child. It still is. 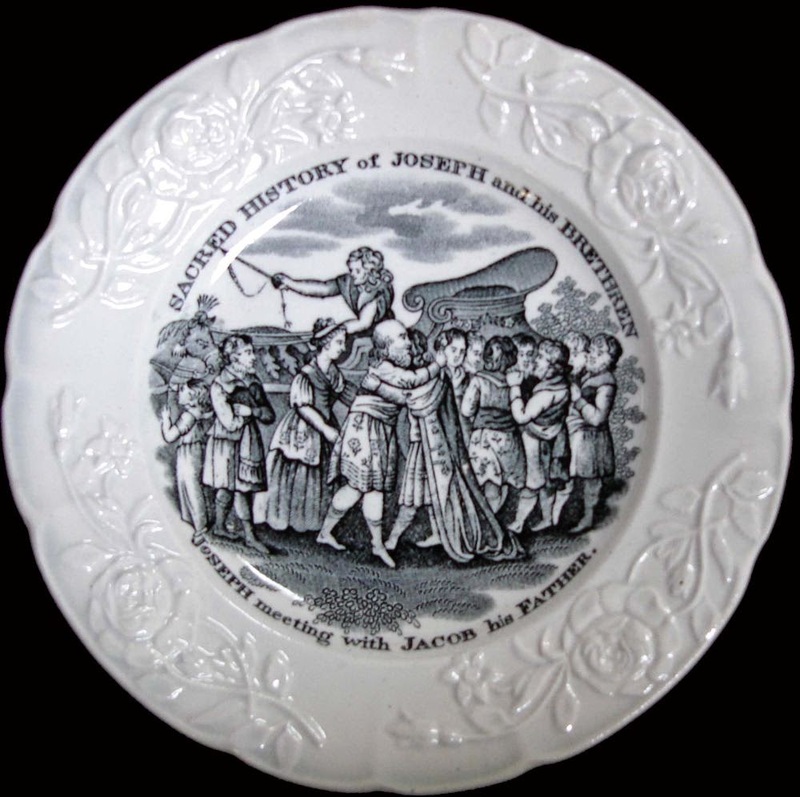 I was lucky to buy 11 plates in the Sacred History of Joseph and his Brethren series a few years ago. I thought I would share them with you. ( I have added a twelfth pattern that I found later). There is no pattern that shows Joseph and his coat of many colors, which to me is the impetus for the whole Joseph story. If Jacob hadn't shown such favoritism to Joseph (the son of his beloved Rachel), Joseph's brothers would not have hated him. 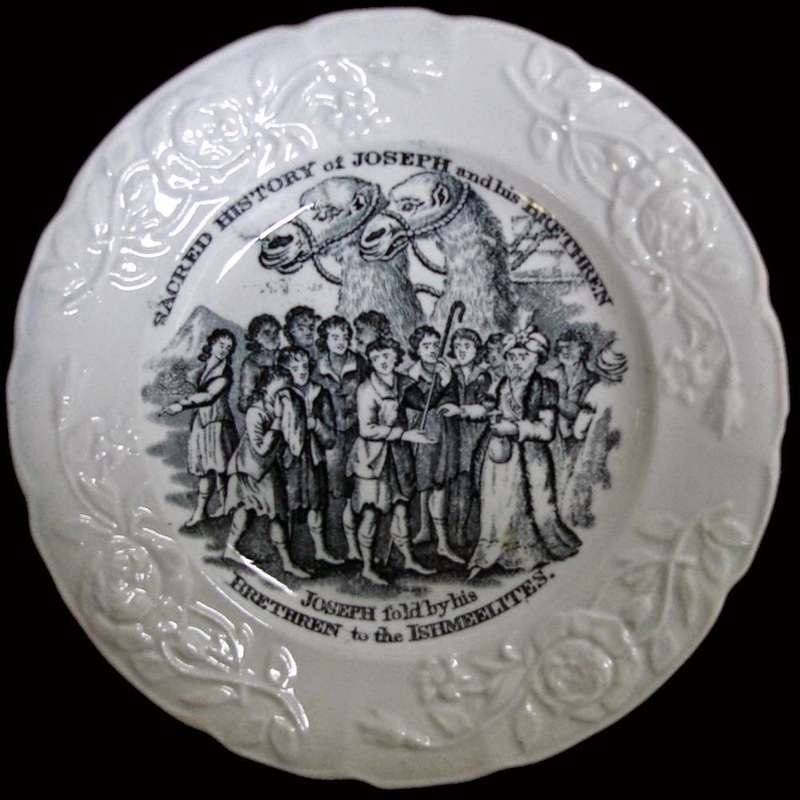 Of course, they also hated him for his dreams, which do appear on the plates. Read the Story of Joseph here. 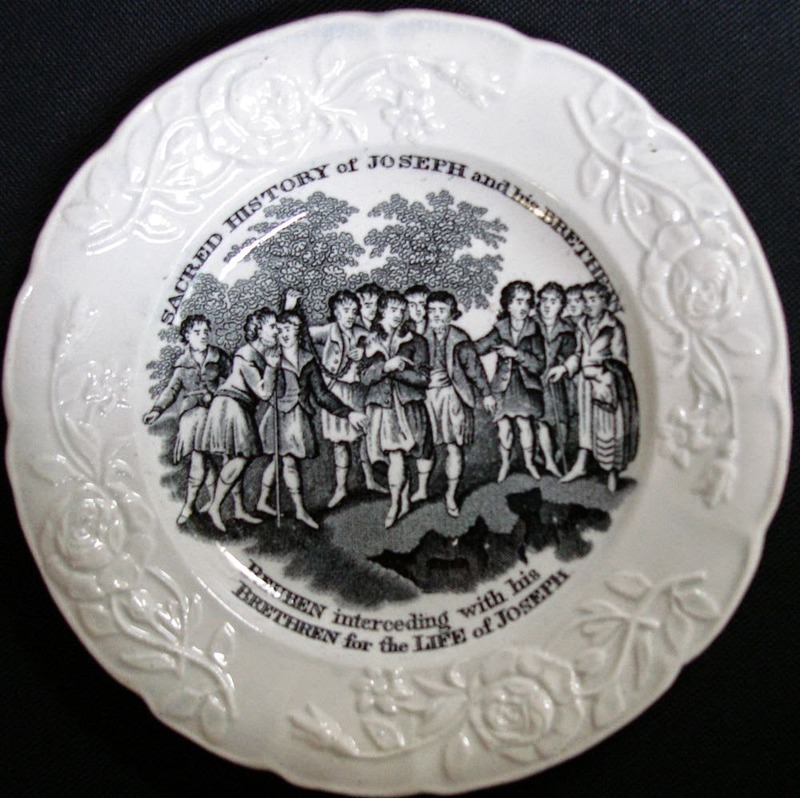 Josephs (sic) Brethren Applying to him for Corn in the time of Famine/You can see that this plate is from the same series, but has an alphabet molded border and added color. This is a set that I know well - they must have been very popular because we see these often. I wonder if these 12 prints make a complete set? I don't know if twelve makes a complete set, but these are the only patterns I have seen. I wonder if a child was given all twelve, or if he or she received only one. I have often wondered this about sets. I can't imagine that a child was given an entire alphabet set for example. Thanks! I didn't know the patterns were also on mugs. I am assuming they are the same patterns as the ones on the plates. 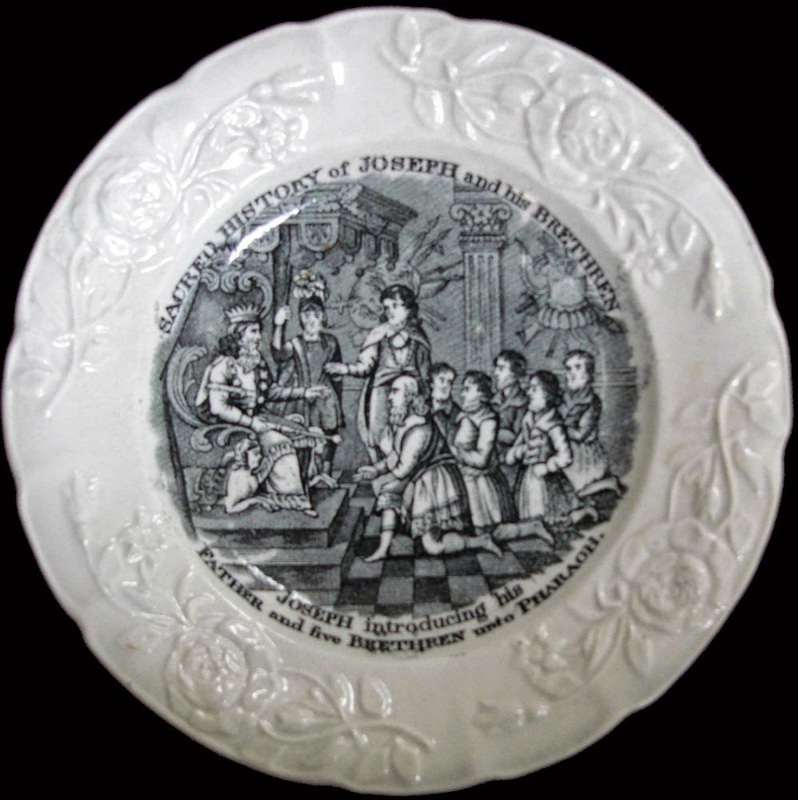 I have one of these plates, and I was wondering how much these plates cost and do you know anything about the manufacturer? 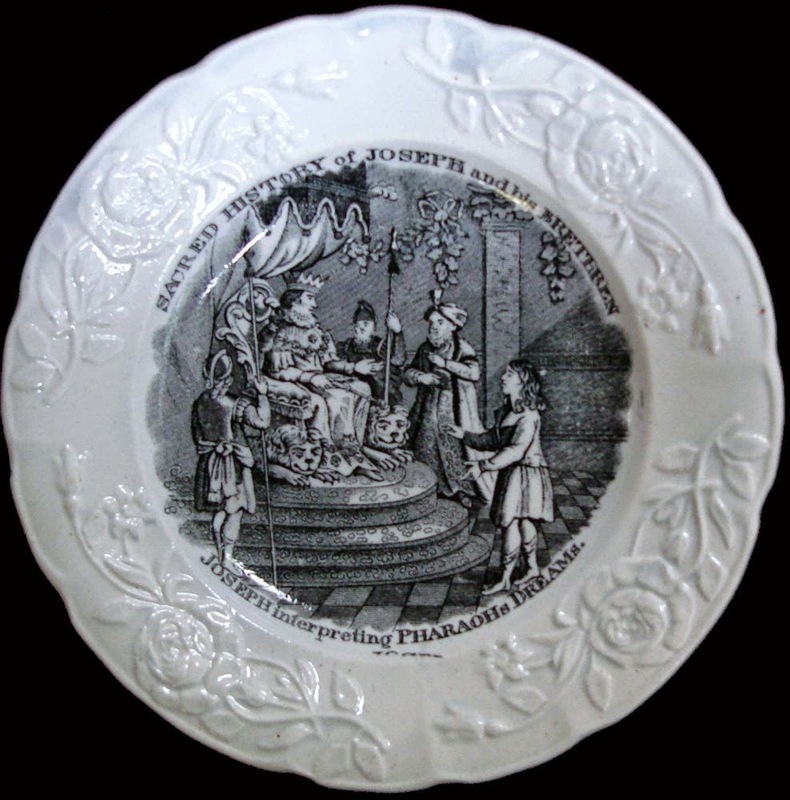 I don't know the exact value of a plate in this series, but I have paid between $50 and $100 dollars. 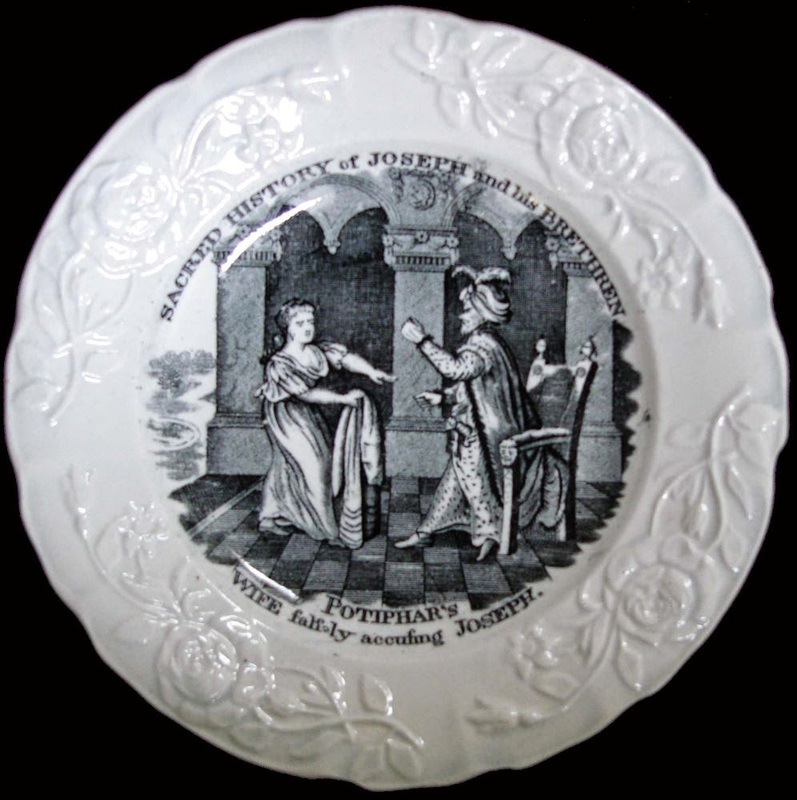 The patterns were made by more than one factory, and the Transferware Collectors Club database shows two patterns marked by Thomas Fell & Co. (1817-1890) and one marked R. A. Kidston & Co. (1835-1845). Most of the patterns are unmarked. 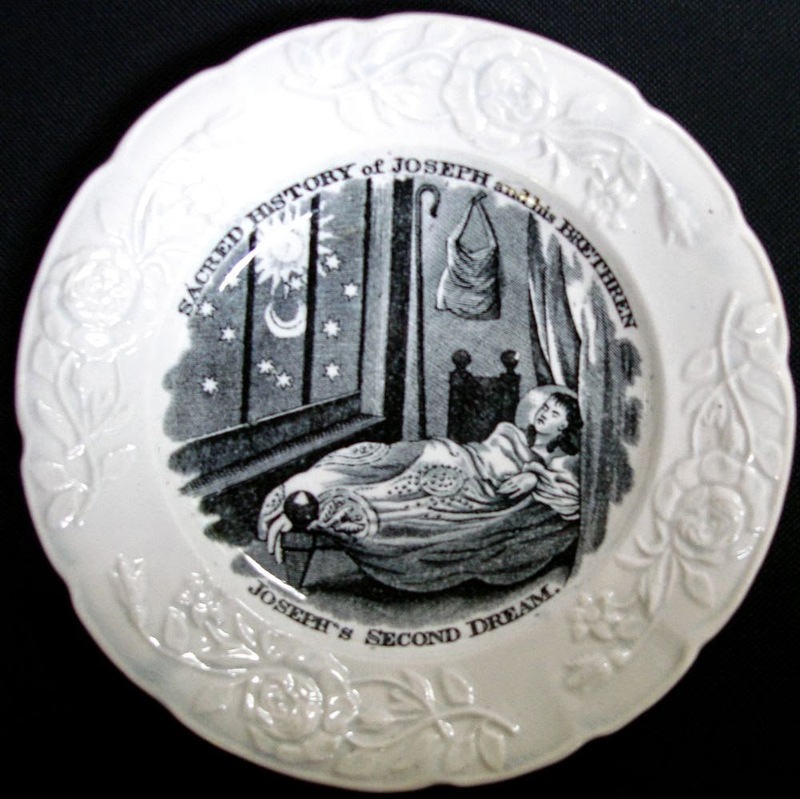 Hi I have one of these plates also, mine though has the picture and writing in black and has Fell and co. as the maker. Can anyone confirm whether this is an authentic reproduction? 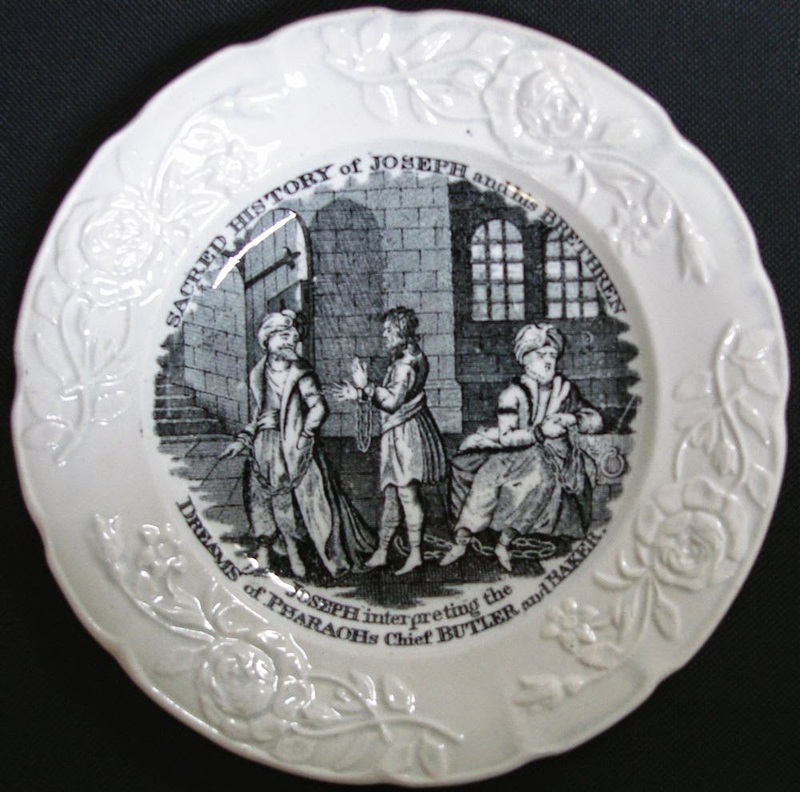 Mine is the one where Joseph is sold to the Ishmaelites by his brothers (brethren).